Email opt-in. We never share your information. Size: 91” x 91” x 37.5” - 42"
Weight: Dry - 897 lbs. | Filled - 5,403 lbs. 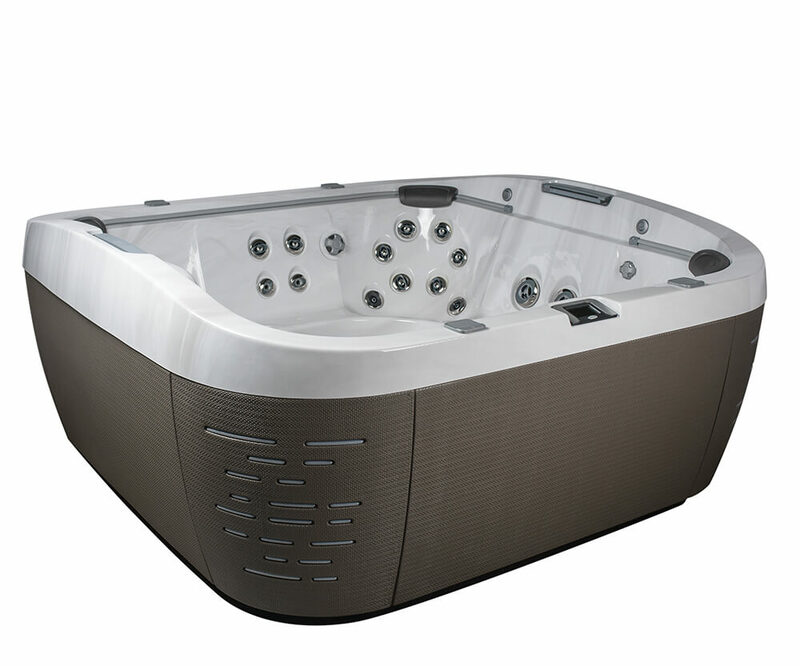 Showcasing a stunning design and superior hydromassage, the J-585™ Hot Tub is the next generation of backyard luxury. Offering room for 6-7 adults, this model introduces a new PowerPro® Jet for the hips, and new PX Jet placement at the wrist. 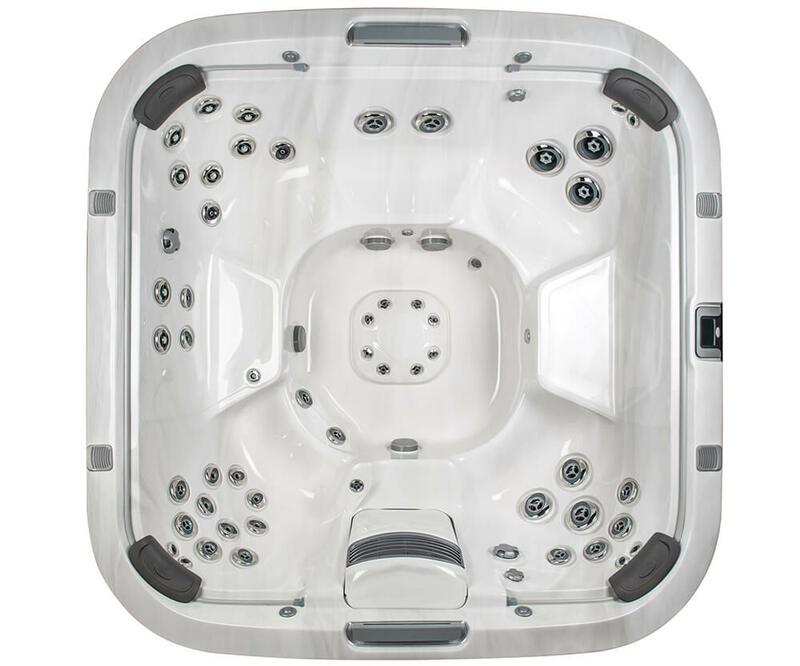 Further customize your J-585™ hot tub with our color options and build and price tool. Watch the following video to get your first look at the features and design that makes the J-585™ such an amazing hot tub. Jacuzzi® Hot Tubs offers a range of shell and cabinetry colors* to lend a luxurious touch to your spa and perfectly complement your décor. Mirrors high-end furniture with a dual high-back design and exterior corner lighting set in a durable Curvalux™ cabinetry. Two waterfalls cascade over ProEdge™ interior illumination for ambiance and beauty. CLEARRAY® utilizes the same UV-C technology that beverage manufacturers, hospitals and other health care environments use, and a 4-stage water filtration system keeps water clean and free of debris quickly. With an open seating design, the J-585™ offers more seating variety. The RX Jet therapy seat with hip jets delivers the deep tissue massage experience you’re looking for, with jets that relax the back and exclusive jets that target achy hips. Size 91” x 91” x 37.5” - 42"
Delivers a deep tissue massage experience, combined with spinning, sizable coverage specialty jets to relax the back, and exclusive jets that target achy hips. Full-coverage spiral action jets target discomfort in your neck and back. Adjustable wrist jets pulse to relieve fatigued joints. And calf jets stimulate small muscles in the legs. This specialty seat offers deep tissue, back muscle knot relief and neck tension release through a deep, highly-contoured seat that positions your body for the ideal hydromassage. The best companies stand behind their products with the best warranties. Click here for more info on what is covered in your new hot tub. Use our Aqua Quip Manuals page to locate this products' manual to get you started quickly and answer most questions you may have about it. Schedule a consultation and get answers to all you questions. Our dealers have knowledgeable sales staff on hand who will go above and beyond. Since 1959, we have benn selling hot tubs to our friends in and around Seattle. For the best in service and maintenance, people choose Aqua Quip. Save yourself hours of work by signing up for an Aqua Quip maintenance package for worry free care of your hot tub today. We service what we sell. If any problems should arise, we'll send a technician to your door and get it taken are of Hassle-free.